Barbra Streisand is an award-winning performer on stage, television, and in motion pictures, as well as a recording artist of popular music. Barbara Joan Streisand was born on April 24, 1942, in Brooklyn, New York, to Emanuel and Diana (Rosen) Streisand. Her father was a high school English teacher who died when Streisand was only fifteen months old. Her mother raised Barbara and her older brother, Sheldon, by working as a secretary in the New York City public school system. Her mother remarried in the late 1940s. Streisand has described her childhood as painful. She was shy as a child, and often felt rejected by other children because her looks were unusual. She accentuated her uniqueness by wearing odd outfits and by avoiding school activities. She also felt rejected by her mother and her stepfather, who was a used-car salesman. Streisand graduated from high school when she was sixteen years old and moved to Manhattan in New York City, where she shared an apartment with friends. At this time Streisand changed the spelling of her first name to "Barbra." She worked in several small plays during this time and also sang in nightclubs. Streisand was spotted by a Broadway producer and was hired to appear in the musical I Can Get It for You Wholesale. The production opened in March of 1962, ran for nine months, and produced a very well-received cast album. With the popularity of her stage role, she was an almost overnight success. Streisand was signed by Columbia Records and recorded The Barbra Streisand Album and The Barbra Streisand Second Album in 1963. Both albums were very successful. The Barbra Streisand Album won Streisand a Grammy for both album of the year and best female vocal. She followed up with The Barbra Streisand Third Album. Streisand then took the role of the comedian and singer Fanny Brice in the Broadway production of Funny Girl in 1964. It was one of the most successful stage productions in the history of Broadway, and her performance in it would win her first of many Golden Globe Awards. 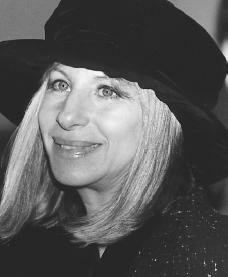 Streisand's next album, People, was one of her highest-selling albums and earned her a third Grammy Award. Streisand next took aim at television. My Name Is Barbra aired in 1965 and its follow-up Color Me Barbra followed in 1966. She appeared in a total of ten more television specials between 1967 and 1986. In 1968, at the young age of twenty-six, Streisand was the largest selling female singer of popular standards since Judy Garland (1922–1969). best actress for this role. In 1969 Streisand appeared as Dolly Levi in the motion picture Hello, Dolly! At this time she received a Golden Globe award as Best Female World Film Favorite. After the success of Funny Girl, Streisand began to concentrate more on motion pictures than on live performances. She appeared in What's Up, Doc? and Up the Sand-box in 1972. In 1973 she won critical acclaim for her work in The Way We Were, in which she starred opposite Robert Redford (1937–). She won another Golden Globe Award for this role. Streisand starred in For Pete's Sake and Funny Lady before her 1976 movie A Star Is Born. The movie and her rendition of the theme song, "Evergreen," earned her a second Academy Award, two Grammy Awards, and three Golden Globe Awards. The film was one of the highest moneymakers that year. Some critics, however, believed Streisand was executing too much control, as she was listed in the credits as not only the star, executive producer, and cosongwriter, but also as the wardrobe consultant and the designer of "musical concepts." Streisand would take yet another leap in her creative life when she decided to direct, produce, and star in Yentl in 1983. Filmed in Eastern Europe, Yentl was the story of a woman masquerading as a man to get orthodox Jewish religious education. The film earned more than $35 million, but it would be four years before she appeared in another film. Streisand's role in Nuts (1987), opposite Richard Dreyfuss (1947–), is the story of a woman who must go through a competency (able to function mentally in a normal way) hearing to determine if she is sane enough to stand trial for manslaughter. Most critics disliked the film, which Streisand produced, but some called it her best work ever. The dramatic role prepared her for the tension and emotion that she displayed in her next movie. In The Prince of Tides (1991) Streisand, opposite Nick Nolte (1940–), not only starred, but directed and coproduced the film. The film was nominated for several Academy Awards, including the award for best picture. Streisand won a Golden Globe Award for directing. In addition to performing in motion pictures and on television throughout the 1970s, 1980s, and 1990s, Streisand continued to release albums. After Funny Girl—Original Broadway Cast Recording there would be over fifty Streisand albums released. Over the years she has recorded duets with performers Barry Gibb (1946–), Bryan Adams, Don Johnson, Neil Diamond (1941–), Kim Carnes, Johnny Mathis, and Michael Crawford. After receiving a death threat in 1967, Streisand developed stage fright and stopped performing in public concerts. She commented to Susan Price of Ladies Home Journal, "You don't get over stage fright—you just don't perform." However, new friendships seemed to have a positive impact. In the early 1990s she began to grow closer to her mother and became friends with then-President Bill Clinton (1946–) and his wife Hillary (1947–). Streisand did a world tour in 1994, starting in London, England, and ending in New York City. Her shows were some of the biggest moneymaking concerts of the year. Streisand released Higher Ground in November of 1997 and it immediately became number one on the Billboard chart. It set a record for the greatest span of time between a performer's first and most recent number one albums—thirty-three years. The first single released from the album, "Tell Him," a duet with Celine Dion (1968–), was immediately a Top 40 hit and was nominated for a Grammy Award. Streisand has recorded fifty-four albums and has collected an overwhelming thirtynine gold albums, twenty-five platinum albums, and twelve multi-platinum albums. She was the first person to win an Academy Award, an Emmy Award, a Grammy Award, and an Antoinette Perry (Tony) Award. She is also the only person to have won an Academy Award for both acting and songwriting. Streisand married actor James Brolin in July 1998. The couple divides their time between homes in Malibu and Beverly Hills, California. She has given concerts to help benefit political candidates and charities that benefit social causes such as acquired immune deficiency syndrome (AIDS; a disease that affects the body's immune system) research. The Streisand Foundation was established in 1992 to help advocate women's rights, civil liberties, and environmental protection. President Clinton presented Streisand a National Medal of Arts in 2000. She gave what she said were her final live performances in Madison Square Garden in New York City that year. Streisand won an Emmy in 2001 for her Fox TV special Barbra Streisand: Timeless. At the ceremony she sang "You'll Never Walk Alone" in tribute to the victims of the September 11, 2001, attacks on New York City and Washington, D.C.
Bly, Nellie. Barbra Streisand: The Untold Story. New York: Windsor, 1994. Cunningham, Ernest W. The Ultimate Barbra. Los Angeles: Renaissance Books, 1998. Waldman, Allison J. The Barbra Streisand Scrapbook. Secaucus, NJ: Carol Publishers, 1995, revised edition 2001.